For the past one year I have been trying to make a new top for my workbench and last week I finally made it. 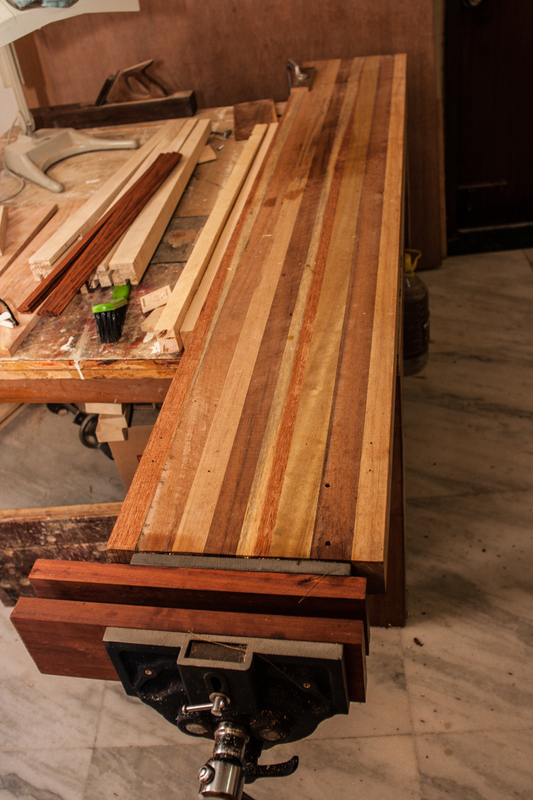 My workbench is an old table with stout Teak legs topped with two laminated four by four feet sheets of ply boards. On one side I had attached two layers of three quarter inch plywood one feet wide by four-foot long in which I had drilled ¾ inch dog holes. On one end a 6-inch bench vice in conjunction with the dog holes took care of most if not all of my clamping needs. This arrangement had worked well for two or three years. I never found a need for a wider workbench top but at times wished I had a slightly longer top that could comfortably accommodate a four feet long board. Over the years the plywood benchtop took a lot of beating and eventually began to lose shape; eventually it was clearly not very flat even. Time for a new workbench top. This time I wanted something longer, say six feet by the same width (12 inches) and two and a half inches thick. For this I picked up several lengths of Saal and had them roughly milled at the timber shop. None of them unfortunately were absolutely straight and I couldn't for the life of me plain them dead straight. 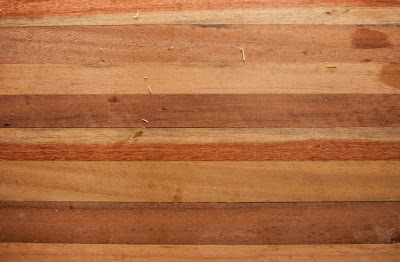 A couple of weeks ago I watched a Paul Sellers video where he explains it is not necessary to have absolutely straight pieces of wood for a benchtop and how it was possible to clamp together slightly bent pieces into a strong laminated top. I planed the pieces best I could and clamped them together and that seemed to do the job even though there were slight gaps in places. The resultant 12 inch by 6 feet by 2 ½ inch slab turned out to be heavy, strong and resilient. The slab was carried to the local timber shop again to be planed and thicknessed; too much work by hand I reckoned. There was some tear out and the slab required a bit of hand planning but it was ready to go. 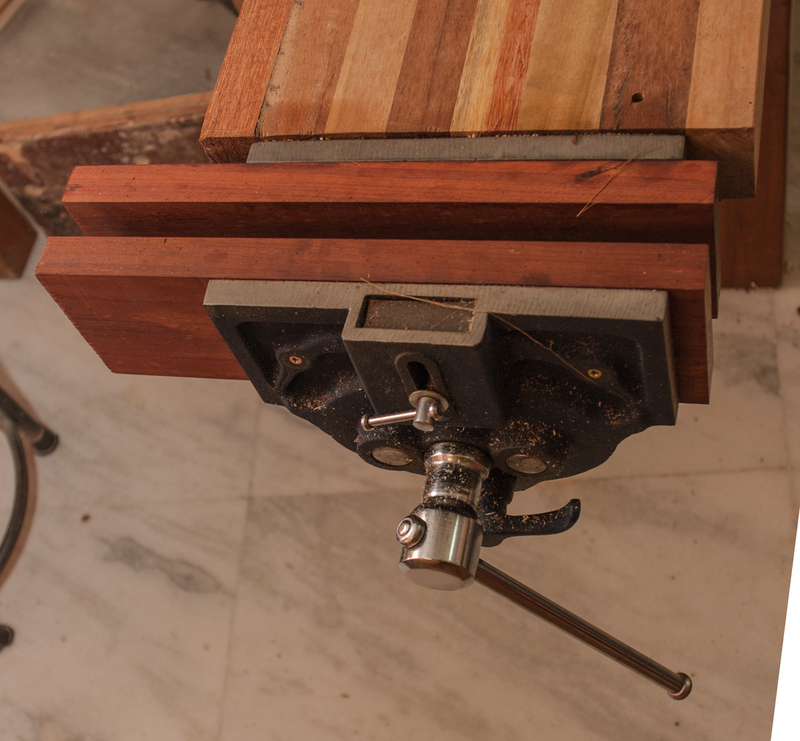 I fixed a 9-inch bench vice purchased over a year ago from Shobha Industries, which weighs over 14 kilos and is one mighty beast. I added two 12-inch long pieces of Padauk to the metal jaws which allows me to safely clamp a six-inch wide board if I wish. I haven't screwed down the top yet or drilled the dog holes but will as soon as I finish making a table my family doctor has requested. I am rather happy with the whole thing; it feels nice to work on a solid workbench top. There is no vibration or movement as I hammer, chop, plane and saw. The Saal top together with the vice would weigh over 35 kilos while the rest of the table would weigh at least another 20 kilos if not more. That is a lot of heft and makes for a very stable work area. I have a three feet by four feet area left on the table for assembly and so on and that is good enough for my purpose. Besides, I can't accommodate anything bigger in the room. My workbench is nothing like a traditional one and looks a mish mash. But it works for me, fits the space I have and takes care of most of my clamping needs, especially because I don't make or plan to make large pieces of furniture, doors and things like that. Even when I make larger pieces I find it is easier to make them in parts - modular stuff - and then put them together. I will perhaps add a leg vice and make a Moxon vice for cutting dovetails. But for now I am one happy woodworker. Well! Whatever works for each individual. I have a metal table frame on which I have a worktop, router table, small tile cutter converted table saw. All that I could accommodate. Exactly! You seem to have crammed in quite a bit onto your workbench! Yes. You just have to see his crude and conjested my so called bench is! How can I post a photo here? Great going Indranil, the top looks solid, it's a good practice not to bolt down the top, helps to plan new additions.I am sure you just getting started. Thanks Abid, truly much left to do. Looks great! More like a saw horse though but would be very useful especially if there were two of them. You could do virtually everything with these. What screw did you use to attach the 9" vice? I am keenly following your blog Mr. Indranil. I am new to woodworking hobby. I am just starting to build a workbench first with Sal wood 2"x4"s. Before that I am looking for One of the foldable workbenches of Skil or Black & Decker make type. I am trying online resources but I couldn't find one. Is there any source to buy one like the Black & Decker workmate. Secondly, I am trying to buy Makita 12mm Router. 12mm I choose as per your advise in one of your blogs. But this model Makita M3600B seems to be good and costing Rs. 9,500. But it is of constant speed. How important is variable speed feature going forward? I examined 8mm routers of B&D, Ferm and Bosch - all are variable speed and costs less also. Congratulations on your choice of a new hobby! Workmates are available in India - machpowertools.com has a Skil workmate that sells for about Rs 2,500. As for a router, variable speed is important if you are going to use a variety of bit sizes - larger the bit the slower the required rpm. Makita tends to be expensive - you could try the other brands like Bosch, though B&D and Ferm, in my opinion, are not very robust models. Thank you very much for reply. Bosch POF 1400ACE, I have physically examined a demo piece at Machpowertools at their store, as I am Chennai based. It is 8mm collect and felt it to be a bit bulky where as Makita though 12mm much slimmer and feels solid. Any suggestion on 12mm Bosch router? Ofcourse I am looking for under Rs. 10k. The workmate is not available with Machpowwertools also. I checked. As I said the POF 1400 is an excellent machine which has served me well. Bits with 8mm shanks are solid and steady - good enough unless you have a particular need for 12mm bits like those for making panels or similar heavy work. Thank you very much for your advise. You are doing really a great job for woodworking hobbyists in India. Hats off to you. ii) Two layers glued together of 19mm MDF board. Please share your experience / views on which one is better. I am in the process of making a workbench for myself and my choice of bench vise is same as yours. A Sobha 9 inch. It will take sometime to deliver in Bangalore. Would like to know how much overhang of the top is required to fit this monster. Also usually bench vise is put at the longer side of the workbench, whereas I see that you have put it on the width. Any particular reason for this. 1. The overhang is about 16 inches. 2. I have put the vice at one end of the workbench top because I find this much more comfortable. I use a dogging system which means the vice also works as an end vice. Also, I find that a vice on the side impedes planing longish boards; an uncluttered side is as great relief. Also, I plan to install a leg vice on the opposite end side; this will not interfere with my planing and will allow me to clamp long boards for edge planing. Thanks Mr. Indranil for suggesting option 1. I was also mulling on this only as it will be more stronger. But in some of the videos on the net, they suggested MDF. Also what about dog holes, will they be smooth edged? Also please advise if any particular type of plywood is better. Reg. installation of leg vice as you referred in your reply to Mr. Atanu Mondal. I am also interested in installing leg vice and I am looking for a bench screw (leg vice hardware) which I could not find in online shops. But I could locate the Quick Release Wood Working Vice (6") for about Rs. 1500 on Industrykart.com which I will be ordering. Please suggest, if you know, any source for leg vice hardware please. 1. Dog holes can be cleanly drilled in plywood. Best is Birch ply if you can get it. Fantastic Indranil. I am planning for a similar setup ,still more customized. I like your design of uncluttered face of the bench which will be very ergonomic.Great custom designed work bench.. Thanks, Mail us your pictures once you are done. Good job Mr. Indranil, What type of glue & clamps did you use for laminating this benchtop? Could you please give some details of gluing process including curing time, clamping pressure etc. I'm planning to build a workbench as taught by Paul Sellers, but I lack experience with glues available in our Indian market. Use the regular white (PVA) glues available in every market. Two of the brands I use are Fevicol and 3M. Curing time: overnight. Clamping pressure required - cannot say how many psi and so on but would need good quality F-clamps, bar blamps, sash clamps - you get the idea. Solid workbench!! The daunting task for a newbie is how to make a workbench, like a chicken and egg problem. Having touched no tools earlier, need to spend quite a lot of money buying the necessary wood and tools to start learning woodworking, funny isn't it? I had gone ahead knowing that there will be a deep hole in my pocket, and bought second teak legs 4*4 (legs only)..later realized the entire table made on teak would cost me close to 30K, lessons :-). I am constructing a house, hence visited the timber shops multiple times in the past six months, and came to know the major wood stocks, Teak, Honne, Sal (Red, Gum) and plyboards. They don't stock any other type of wood, like Neem, Babool etc which may come for a cheaper price and serves the purpose, the reason may be its not preferred by the construction industry which is a major consumer. Later I stumbled upon a street where the packaging wood was sold, and found that they do keep Pine wood in almost all cut sizes. They are not heavy for the size, and looks workable by the hand tools. After some thought bought enough 4*3 and 2*4 to make the Paul Sellers model of the workbench, not sure this type of wood is fit for the workbench. I am yet to start on the project, more Chicken and Egg problems, need to sharpen tools etc .. meanwhile I made a Chalkboard using these materials to get started. Your blog is of great help, appreciate the time you spent for woodworking DIY community. 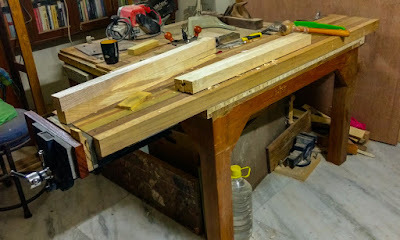 No point making a workbench out of Teak unless you have lots of money to blow. Pine will do just fine. Sharpen your tools before beginning on the workbench project though. Best of luck.